Review Not so long ago, El Reg was pulling apart, in every sense of the phrase, Elgato’s Thunderbolt Drive+ SSD. 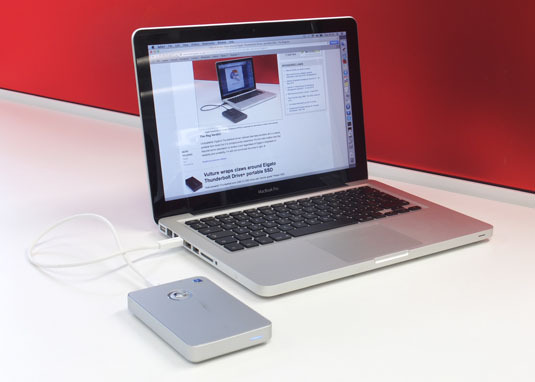 A portable 512GB storage device with USB 3.0 and Thunderbolt interfacing. It put in a nifty performance, for sure, but man, it was pricey. By contrast, the GTech GDrive Mobile with Thunderbolt drive has a much lower cost, double the capacity, but relying on a hard disk drive for its 1TB of storage, its performance can’t match the SSD and you’d never expect it to. 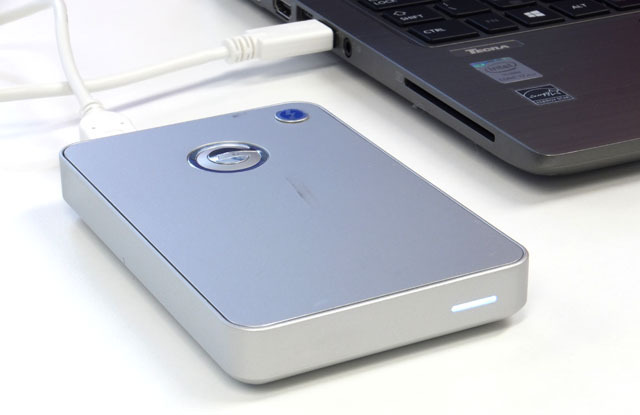 Still, we have a choice here, and just like the Elgato, this GDrive is host powered and comes in a robust package measuring up at 127 x 83 x 18mm and weighing 295g. GTech doesn’t claim it has any IP-certified dust and moisture resistance, but as Elgato’s Drive+ seemed to offer little more than a hard case and some rubber bungs to cover the interfacing, you’re probably not missing out on a lot here. That said, after a travelling with it for just one round-trip commute, hurriedly slung into a laptop bag with a MacBook Pro, I found substantial markings on the aluminium case that wouldn’t rub out. It looked so new and handsome before. Now it appeared to have been through the wars. With little else to worry about cosmetically, taking it apart seemed to be the only sensible option. More on this later. 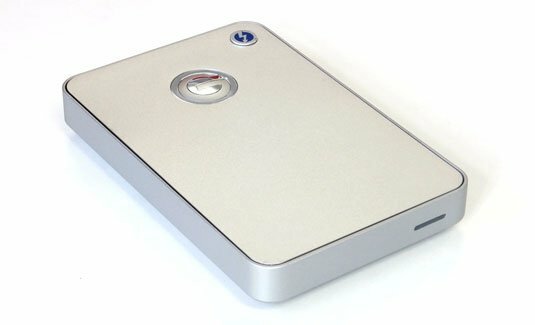 You don’t have to dismantle the GTech GDrive Mobile Thunderbolt drive to find out that it has a 7200RPM 2.5-inch Travelstar 7K1000 drive inside with SATA 3 interfacing, not that it’ll ever get to 6Gb/s. Instead, the Travelstar tech specs claim 1284Mb/s with the GTech sales blurb suggesting transfers speeds of 136MB/s. GTech supplies cables for both Thunderbolt and USB 3.0. The Elgato did likewise and it seems this trend of actually supplying Thunderbolt cables has at last caught on, with most other vendors following suit these days. It always seemed like a slap in the face to take a Thunderbolt drive home and then discover you’d need to fork out £30 just to use it. 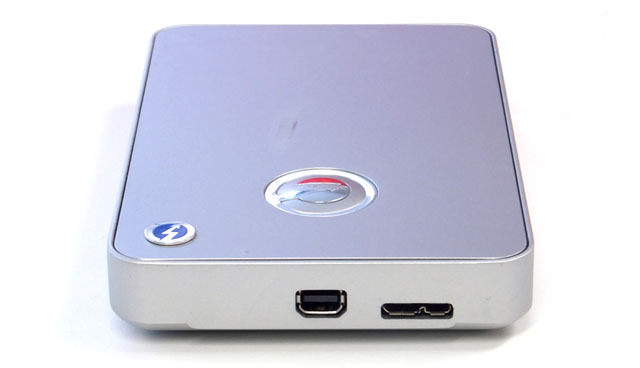 Another thing I’d like to see catch on is for Thunderbolt drives to include USB 3.0 interfacing. These portable models have got it sussed, but they are end point devices with only one Thunderbolt port, as there’s no daisy chaining here. Yet the reason for dual interfacing is pretty obvious, few PCs have Thunderbolt and world+dog has USB. You might think the story ends there, but during tests I was reminded that the Thunderbolt equipped MacBook Pro I was using didn’t have USB 3.0. Hence the transfer speeds with USB 2.0 were somewhat unremarkable, to say the least. Indeed, from 2011 to mid-2012 Apple produced quite a lot of Thunderbolt equipped machines with just USB 2.0 – it seemed the whole range was configured this way. So while Thunderbolt on an HDD might not make sense when you’ve USB 3.0 around, for Mac users from recent years that’s going to be the fast route to transfer files. FireWire 800 was good in its day, but external storage never seemed to get close to its theoretical maximum. The CrystalDiskMark 3 results below highlight the issue. Due to the limitations of the HDD, the Thunderbolt and USB 3.0 figures are close to identical and the USB 2.0 results are obvious from the low rankings. Certainly the transfer speeds on Thunderbolt and USB 3.0 aren’t far off the GTech’s figures and this is testing on Windows with the drive formatted to NTFS. I did similar tests on the Mac with HFS+ formatting and, for a cross platform scenario, installed Paragon Software’s NTFS which delivered a seamless performance in comparative format tests. Next page: Enclosure disclosure... Plus: WTF - put DOWN the screwdriver!